March 12, 2011, Salem, Ore. Weather included light rain and less than light wind for the morning. 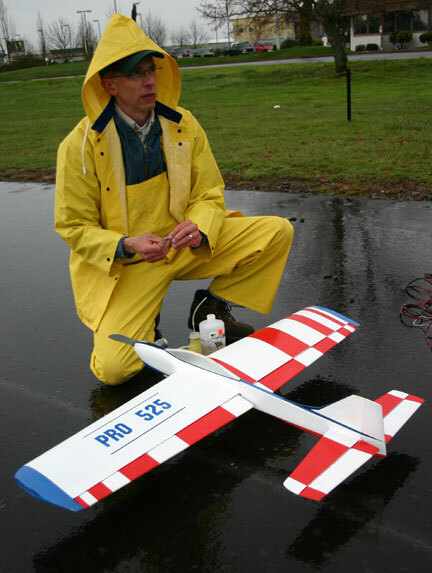 Gordon Rea of Eugene donned rain gear and put up a few flights on a couple of stunters. For being the only flyer, he was given the top prize from the drawing, a Jetco Dolphin kit. After about an hour of hanging out in the weather, most of the group broke up with several going over to the Flight Deck restaurant for hangar flying. Attendees at the field were: Bruce Hunt, Gordon and Dean Rea, Jim Corbett, John Thompson, Mike Hazel, Richard Entwhistle, Jim Harper, Don McClave, Robert Ladd and Gerald Schamp. Showing up a bit later at the restaurant get-together were Ron Bennett and Craig Bartlett. 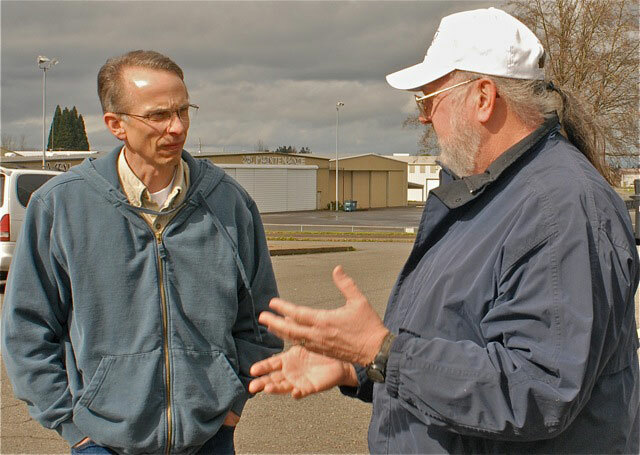 The next stop in the Oregon Flying Fun series will be in Eugene on April 2. See Where the Action Is for details. Warm and dry after heading in from Bill Riegel Field in Salem, some of the Oregon Flying Fun No. 3 crowd is seen at the Flight Deck restaurant. 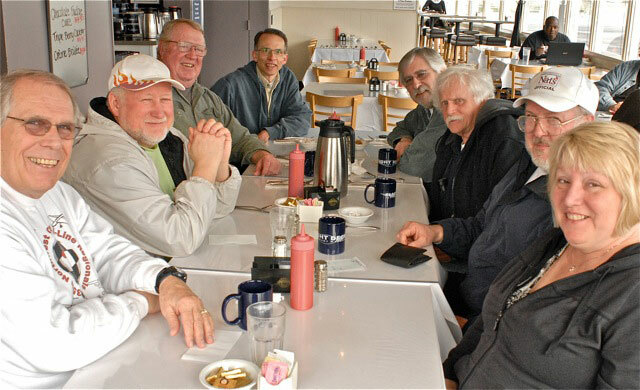 Left to right: Gerald Schamp, Mike Hazel, Jim Harper, Gordon Rea, John Thompson, Richard Entwhistle, Bruce Hunt, Brenda Schamp. Dean Rea photo. One flier who did brave the elements while others huddled under the trees was Gordon Rea of Eugene, Ore., who flew his profile stunter several times. Gordon is a fast-improving stunt flier. Bruce Hunt photo. Bruce Hunt (right) gives Gordon Rea some stunt tips. Dean Rea photo.